What You Need to Know about Machine Learning? Title What You Need to Know about Machine Learning? Machine learning and predictive analytics are becoming one of the key strategies for unlocking growth in a challenging, contemporary marketplace. It is one of the fastest growing trends in modern computing, and everyone wants to get into the field of machine learning. In order to obtain sufficient recognition in this field, one must be able to understand and design a machine learning system that serves the needs of a project. But where do you start? 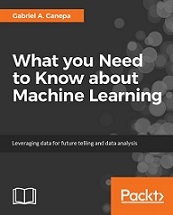 This book offers you the perfect place to lay the foundation for your work in the world of Machine Learning, providing the basic understanding, knowledge, and skills that you can build on with experience and time. So don’t wait, download now and see just why Machine Learning is essential in our modern world!